Photo walks in Jaipur? The first photo walk I ever took was when I bought a DSLR for the first time, a few years ago. I joined a photo walk organized by a leading newspaper on the World Tourism Day, here in Jaipur. I feel photo walk is a great way to network and meet new people. As for photography, it is counter productive in some ways when a large group distracts people i.e. subject. It’s difficult to photograph people in the natural setting. Also, the photographers start copying each other, often clicking the same subject even when there are plenty of other opportunities. On the other hand, some people feel that it provides you an opportunity to see & learn from the fellow photographers. This is certainly a valid point. After a long gap, I decided to join a photo walk in Jaipur organized earlier this month by a local photography group on a Sunday morning. The incentive to join this photo walk was to break away from the “usual mindset” rut and think afresh! Sometimes, it’s good to come out of your shell!! Also, photography on the streets of India offers a great chance to learn and adapt. This particular picture captures few professional and budding photographers of Jaipur before the photo walk began with a backdrop of heritage buildings of the Pink City. The theme for this photo walk was “hands”. The walk was routed through the old Jaipur bazaar in the walled city area, which has many heritage buildings & structures. I have never been into clicking portraits which falls under the street photography. Walled city area in Jaipur is a great place for clicking portraits and street photography. For this this photo walk, I’m not posting any portrait images; choosing only faceless compositions.So here are 13 Faceless Frames, I composed during this short photo walk of 30 minutes capturing street scenes from Jaipur. The gentleman in this picture was enjoying tea at a roadside tea Thela (cart) when a group of photographers swarmed in. He looked disturbed when a few photographers zoomed on his face with zoom lenses, taking an aim at his tea ritual. I settled for his hand though! Taking stock of the business! This flower vendor was catching up with the news in a newspaper. In this case, he was flipping through the obituary section. Taking a stock of how his day will be? A tea vendor pours tea into a “takeaway”! The person in this picture is a watchman at an undergoing metro(tube) construction site. With nothing to do during the morning hours, he was watching the world go by. I found this interesting tattoo sign the hands of a boy. I found him sitting along with his friends outside an old temple entrance gate. This is a picture of a flower vendor. Waiting for the customers. A fruit vendor loading and arranging his fruit display. A usual morning ritual before the customers arrive! These grain sellers can be spotted across the walled city area in Jaipur. They survive on people looking to earn good karma! As per Hindu belief offering feed or grains to the birds and animals improves your karma! The flower seller gets into the action as he sorts and trims stem for the bouquet. The flower seller waits with the marigold garlands. Marigold garlands are bought by the devotees while offering morning prayers, especially in the commercial establishments where a fresh garland is offered to the God or deity as a daily routine. A scooter rider waiting by the roadside….for whom? ..No idea! Finally, these two pictures are my favorite ones. The above picture is of a poor homeless person. I felt sad-looking at his expressionless face. He was staring at “infinity”. There was so much hiding behind his face. Many stories….. I clicked this picture at a roadside Thela (cart), a fruit selling vendor. This boy was a four-year old son of a fruit selling lady vendor. He was leaning towards his mother for the security while watching the world go by! 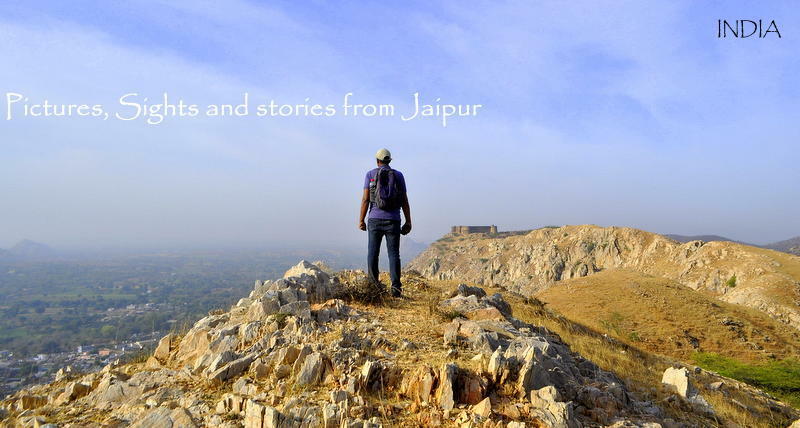 Would you like to undertake a Photo Walk in Jaipur? This post appears as a part of weekly photo challenge Heritage. Wonderful photos! I have never thought that hands could make such meaningful photos. Learned something today – thank you. Thanks Helen. This was something new for me too. Do you undertake photo walks? I have never participated a photo walk. We don’t have those in this town. My guess is a group of people get together and shoot photos at some place, yes? Yup. In which city do you reside Helen? Cool photos! I haven’t been to Jaipur since I solo-backpacked there back in 1985! Just the hands talk so much, telling a unique story of the time, place and person. A great idea to capture just the hands, loved it! Such an interesting topic and equally intriguing captures. Hands in various activities… Beautiful and vivid captures. Pink city my fav city. What an indigenous way to capture the essence of the city without labelling it in an obvious way. I loved the entire Faceless series. But my favorite has to be the one where the guy is packing Chai. Yamini, happy to know you loved these pictures. Faceless photos is another perspective of capturing pictures. I guess most travelers & photographers are focused on clicking faces in the street, personally I don’t. I guess that tea picture is a very popular choice. Thanks for sharing your views. Absolutely loved this post!! Never really though of this style of capturing the essence of a place! So beautiful! So bummed that we still haven’t been to Jaipur 😦 well as a kid yes but that was ages ago haha! cannot wait to visit this beautiful place! Enjoyed your post and the faceless frames Arv. I have never been out on a photo walk with a group Arv, but as you have mentioned it is a good opportunity to come together as a group, and creatively engage in photography. In the process, one starts appreciating the beautiful and interesting things around and this may also help to strengthen the sense of community and the sense of belonging to the place. You have a point Arv. People may be more open to getting clicked by a group than by individuals. Wow I love that you concentrated on people’s hands the pictures are very interesting!! I have a friend who asks me to go to photo walks but then I am a bit prejudiced against them because as you said everybody tries to take the same picture – the group kind of creates a norm (which usually is portraits of old people or babies …) and I don’t like to show my pictures for validation. However, your take on that really inspired me, thanks! Pingback: Photo Walk in Jaipur- Shapes – Jaipur Thru My Lens !! Pingback: 11 Seconds – Jaipur Thru My Lens !! Enjoyed each one of the pics, Arvind. The shots were amazing, particularly the way you caught the hands— both resting or in action. I like this idea of a photo walk. I see that as a great opportunity in Bangalore where I’ve always wanted to capture two things —trees and old houses. Maybe on a quiet Sunday morning away from the snarls of the traffic… I think I will give it a shot sometime soon. I have always loved looking at peoples hands. There is so much to be told about the person in them. It’s interesting theme, Arv. When I was in Istanbul, there were so many events like this. Personally, since I knew the city, I prefer to shoot alone when I could stay at one spot I like as long as I like. But it was good chance too sometimes to meet other people who have same passions as mine. I love all your photos.. But my favorite is the hand of homeless man. It tears me apart..
Well, I was always ended by taking the photos of buildings. I realized that I am not really good in catching people’s expression, particularly for portraits. I will, Arv.. Thanks for the encouragement.. Previous Previous post: Bitten by a Travel Bug? Be a tourist in your own city!